The English Setter is practically the poster pup for sporting dogs, but are they as suitable for home life as they are for the field? It all depends on how you raise them. The English Setter we know today is a conglomeration of the Springer Spaniel, Water Spaniel and the Spanish Pointer. As its name implies, the breed was originally developed over four-hundred years ago in England as a pointing dog, meaning it was bred to fixate on any game birds it detected in the field, and literally point the way for its master. Although a single breed, the English can be divided into two distinct types: show and field. The show-type English, developed largely by Edward Laverack, is slightly more refined, and carries the glowing coat fringes that make this breed so photogenic. On the other hand, the field-type English is slightly heavier in build, and carries a more serviceable coat for working outdoors. This type is often referred to as the "Llewellin Setter," named after R. Purcell Llewellin who pioneered this strain of the breed. Bearing the different styles in mind, the English Setter bares a close resemblance to its cousin the Irish Setter. These dogs are fairly streamlined, and the overall appearance is one of elegance and athleticism. The English is easily distinguished from other setter breeds by its uniquely speckled coat: shades of brown, orange, lemon or blue dapple across a glossy, slightly wavy white background. The coat is naturally shorter on the main body, but grows longer on the ears, tail, chest and undercarriage. It also feathers out on the legs and paws. Brushing is necessary to keep the coat from matting, and dogs taken into the field should be checked for burrs upon their return. The English Setter is an easy going soul, although some members of this breed can be a bit rambunctious if not properly trained early on. These dogs are both loving and willful, a somewhat challenging combination for the average pet owner. Inside, the English Setter is fairly docile and compliant, although housebreaking takes some major effort on your part. Outside is a different matter altogether. Here, the Setter's field instincts take over, and your pet will be more focused on the birds than he is on you. Some owners find digging and jumping fences to be a frequent problem with these dogs, making it difficult to keep them in the yard. Here's the crux of the matter: English Setters, for all their energy and intelligence, are really rather soft in temperament, and take any sign of displeasure from you deeply to heart. These are not dogs that do well with being reprimanded for their mistakes. Instead, training is best achieved through positive reinforcement, such as used in the clicker training method. Clicker training involves marking the exact moments of your dog's desirable behaviors with a click and instant reward. Unwanted behaviors are simply not rewarded in any form. The premise is that your dog will learn to repeat behaviors that bring treats or praise in favor of wasting time on behaviors the bring him nothing good, and many owners have found this method successful. Overall, the English Setter breed is a fairly healthy one, although as with many breeds there are some genetic problems in the blood lines. On average, members of this breed will live a good ten to twelve years. English Setters require a good deal of outdoor exercise to burn off their abundant energy, so be prepared to come along for the romp. Leaving them alone in the yard is tempting fate and their natural instincts to look for game. Bottom line, these dogs need some activity to thrive. English can also become nuisance barkers unless you stay on top of the situation by distracting them from the action into other behaviors you can reward. If these challenges don't daunt your enthusiasm for the breed, then the next logical step is spending time getting to know them better at a responsible breeder's kennel. This way you'll fully understand what you are taking on when you bring one of these magnificent creatures home. 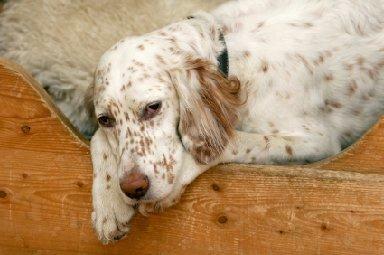 The English Setter Association of America, a source of breed and rescue info.